Your tired workhorse trudges slowly along the bank of the Irrawaddy. To your left and right, spires peek out from behind trees that are somehow still green in the dry dusty heat of the Burmese plain. The road is flanked by zedis (stupas) and as you near an ancient tumbledown city wall, your driver stops the cart and suggests lunch. He ushers you into the ramshackle roofed space that constitutes a restaurant here. For only a few kyat, the equivalent of three dollars, you get a Burmese feast of curries and various other dishes. In a few short minutes, you are stuffed to the rafters with lahpet thoke (pickled tea salad) and rice. Rolling back onto the buggy, your driver sleepily gees on the horse to take you into the walled city of Old Bagan. Until 1988, Old Bagan was sparsely populated by the native Bamar (Burman) people. The government of the time evicted the few remaining residents in an effort to promote tourism. 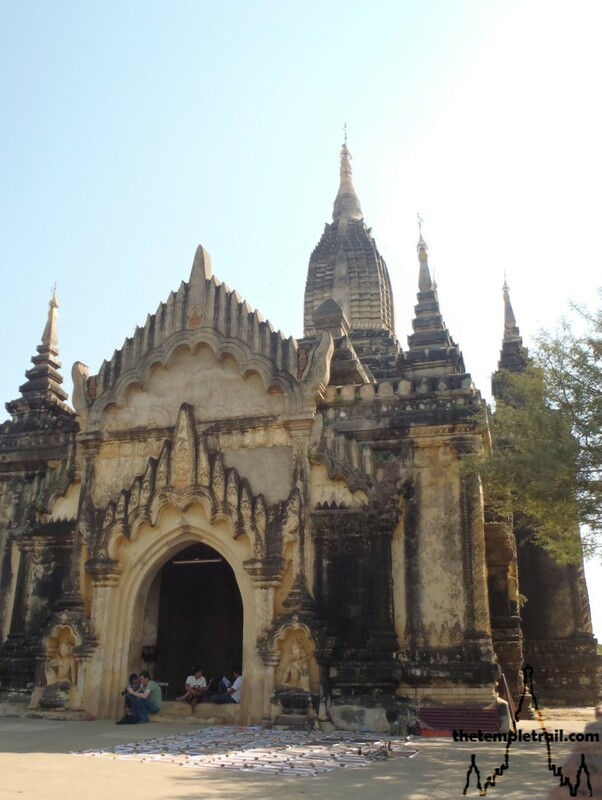 The result was the town of New Bagan to the south and consequential emptiness of the old city. Tree-lined dirt roads criss-cross the once bustling city and your journey takes you in a disorientating manner through them. After crossing the fortified town, you arrive at the northern extreme, where the land meets the river. Here, you are in one of the oldest sections of the Bagan landscape, at Buphaya. Approaching the diminutive temple, you spot a rotund little figure next to the guardian lions at the main entrance. Stepping through, you are entering into a place of legend. 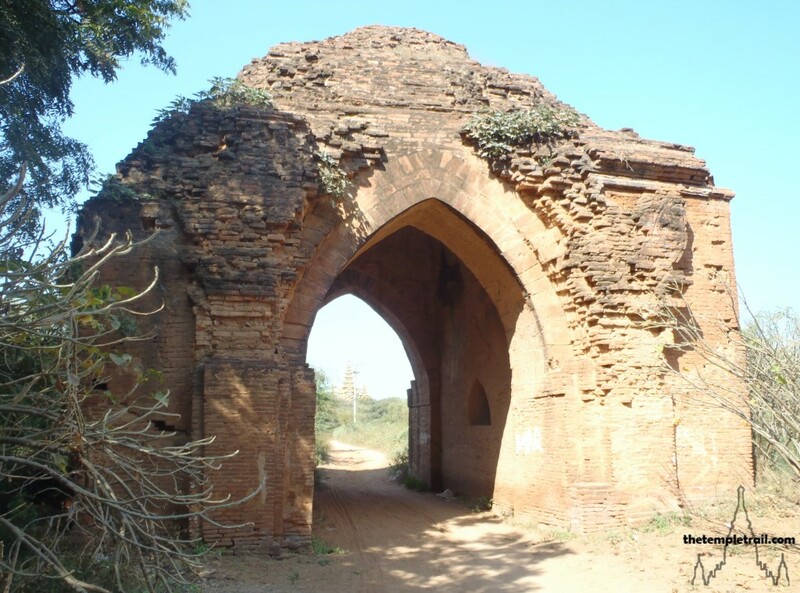 The exact history of the site is uncertain, but the locals believe that it was built by Pyusawhti, the 3rd king of Bagan, in the 2nd or 3rd century. Pyusawhti is a legendary king and the accounts vary on his story. The earliest stories say that he was the child of a sun god and a dragon princess. The 19th century Hmannan Yazawin (Glass Palace Chronicle) tells of him defeating a giant bird, tiger, boar and squirrel-like monster. After he did this the first king of Bagan, Thamudarit, gave his daughter as a wife to Pyusawhti. The spot you stand at is the location of a fifth ‘menace’ that plagued the new kingdom of Bagan. Above the doorway, you spot an egg-shaped figure flanked by axes, indicating the story of the site. 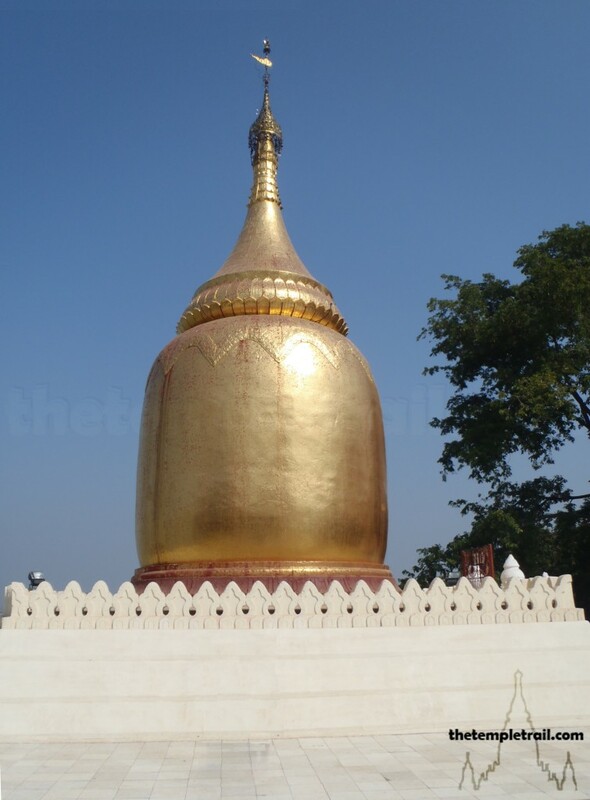 The small golden stupa you see is commemorative of Pyusawhti clearing the site of an infestation of a gourd-bearing vine that choked the river. After he ascended the throne, Pyusawhti built a pagoda at the location of each of his five victories. This place, fittingly has the Buphaya (gourd pagoda). The shape of the stupa is that of a gourd or pumpkin, in acknowledgement of the deed performed here. Many scholars believe the original structure hails from the 9th to 11th century, based on the architecture, but the debate can never be resolved, as what you see is actually a total reconstruction. The 1975 earthquake that wreaked havoc on the plain of Bagan, sent the original brick stupa crumbling into the waters of the powerful Irrawaddy. The gilded pumpkin is a concrete reconstruction that contains no relic and is hollow. The gilding that is so pretty to your eye is also a new addition stylistically. The photos of the original show no signs of gold at all. The earthquake did reveal some terracotta votive tablets of Avalokitesvara (a Bodhisattva) and Buddha from the Pyu period, indicating that the later construction date is more likely. While the stupa is a rebuild, standing here looking at it twinkle like a beacon over the glittering waters of the Irrawaddy, it still holds great power. It is small, but beautifully formed. 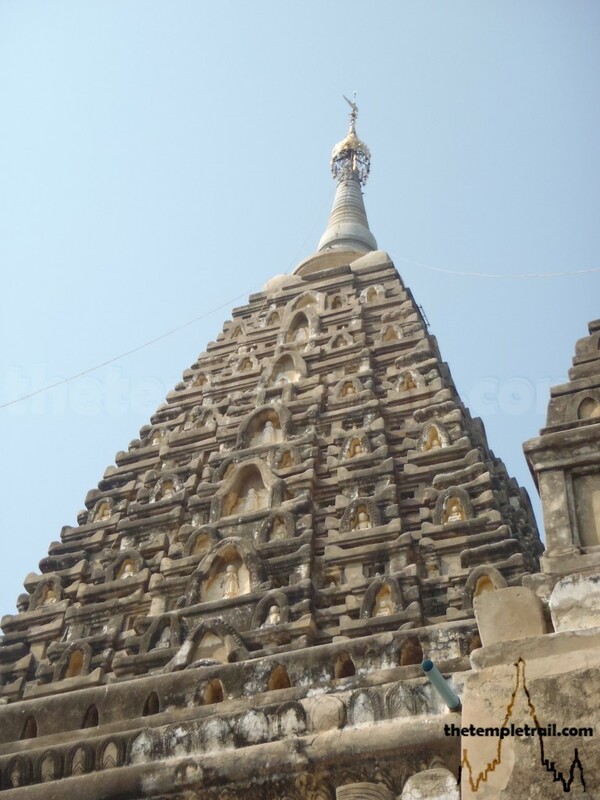 Returning to your cart, your journey soon brings you to the Mahabodhi Guphaya. As soon as your driver pulls up to the temple, you see how different the structure is from anything else in the area. The pyramidal Sikhara (roof tower) draws you towards the sanctuary and you find yourself in a state of wonderment at its towering beauty. Built in the mid-13th century during the reign of King Htilominlo, the guphaya (hollow temple) is modelled after the Mahabodhi Temple in Bodhgaya, India. Its inspirational forebear is where the Buddha gained enlightenment under the Bodhi tree. The tower has the most presence, but other features abound at the site. You circle the central building anti-clockwise and visit the first of seven sacred places (just like at Bodhgaya). The Ratanaghara (House of Gems) is older than the main guphaya and you step down into it. It once had a glorious reredos (altarpiece), but all is now in ruin. 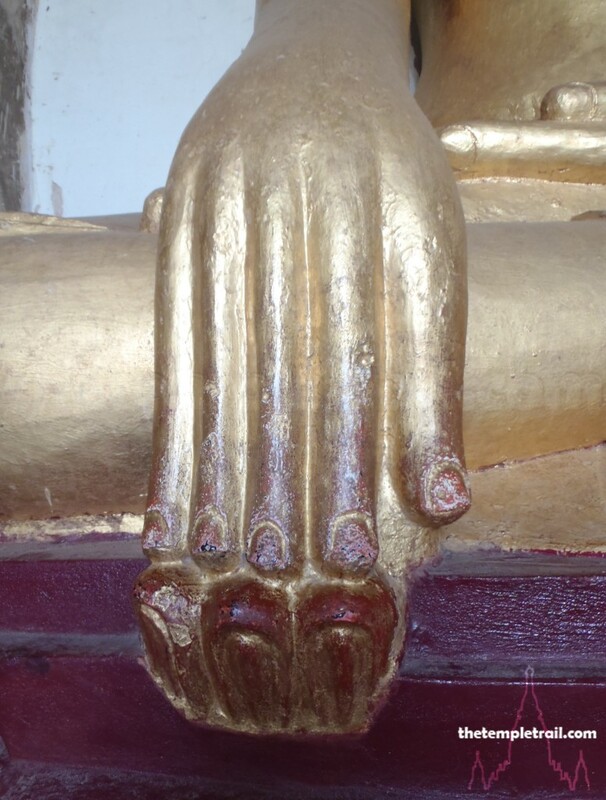 It represents the place that Buddha contemplated the Abhidhamma (metaphysical teachings) after his enlightenment. Surrounding the Ratanaghara is a moat that terminates at the Lake of Mucalinda, a small reservoir. This is representative of the abode of Mucalinda, the nāga who sheltered Buddha from the elements as he sat in meditation. The rain that flows off the guphaya feeds the lake in the wet season. Looking upwards to the Sikhara, you see that it is pockmarked with niches that contain more than 450 Buddha images in various postures. The spire at the top is finished with a golden hti (umbrella) that crowns the whole 40-metre structure. Entering the guphaya, you are faced with a statue of the Buddha with his right hand touching the ground in an earth-witnessing defeating Mara mudra. The upper level contains a similar image. As you sit in the shady interior in the presence of the newly-enlightened Buddha, you find yourself at peace. 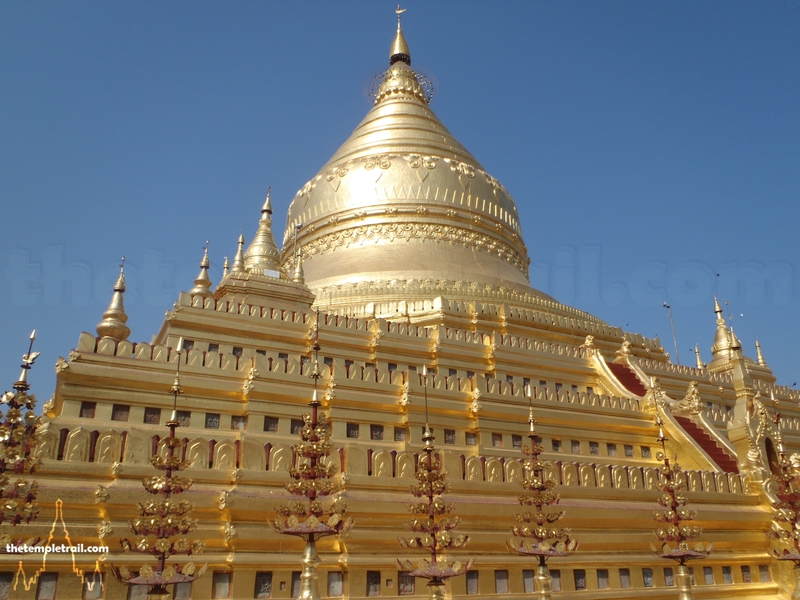 The site is very important, as it is the physical manifestation of the story of the Buddha. 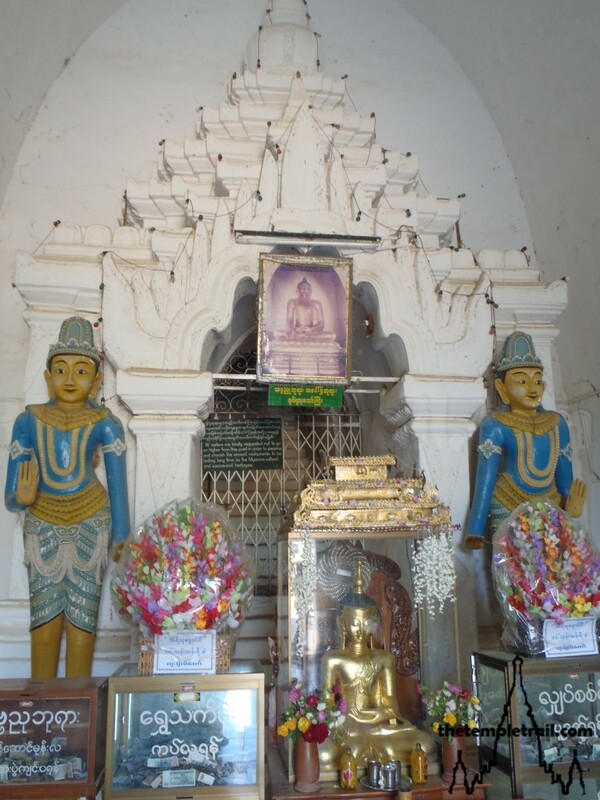 The famous 11th century King Kyanzittha sent a mission to Bodhgaya to repair the temple there, his descendant Htilominlo brought the pilgrimage site to the people of Bagan. Departing once more in your buggy, you head back towards the Irrawaddy. Downstream from Buphaya, the second tallest temple in Bagan makes its mark on the skyline. Gawdawpalin Guphaya is a tall building with a tall story. In fact it has two. Stepping up to the white and gold edifice, you are viewing a heavily reconstructed temple. 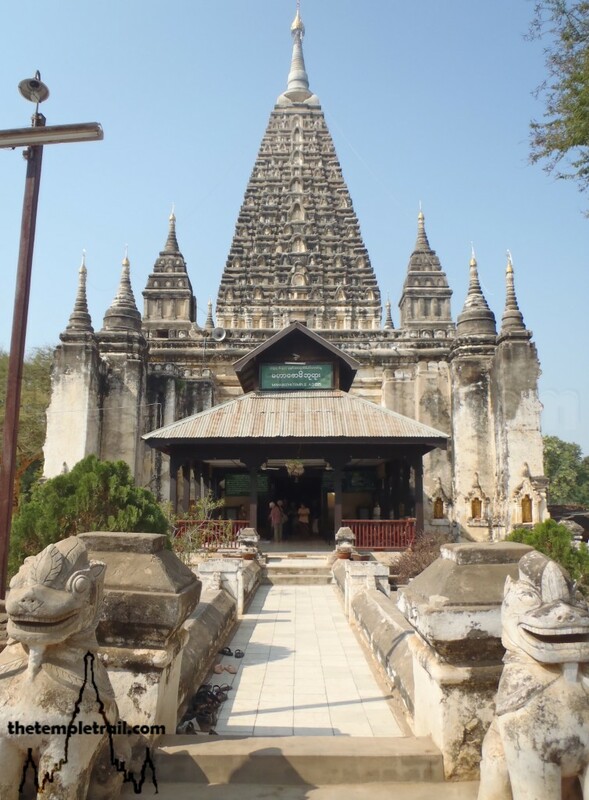 The epicentre of the 1975 earthquake was very close to Gawdawpalin and the Sikhara and upper sections were rebuilt in the wake of serious damage. As you look at it, all 55 metres of the building are seamless and to the naked eye, it is one uniform mass. The temple was built through the reigns of two monarchs. Started during the rule of Narapatisithu in the early 13th century, it was complete in 1227 during the sovereignty of Htilominlo. The name of the temple means ‘the throne which was worshipped’ and there are two possible stories behind it. One explanation is that King Narapatisithu was so vainglorious and brutal throughout the construction of the Sulamani Guphaya, that the famous monk Panthagu Mahathera fled to Sri Lanka. After being persuaded by the king to return after six years of exile, homage was paid to the monk by Narapatisithu on this spot. The second story is that the proud Narapatisithu, was punished with blindness by the spirits of his ancestors for thinking himself better than they. The court astrologers advised the king to make idols of his ancestors and place them on thrones. This he did in the place you now stand and his eyesight was restored as he worshipped them. He then had the temple constructed to memorialize the act. 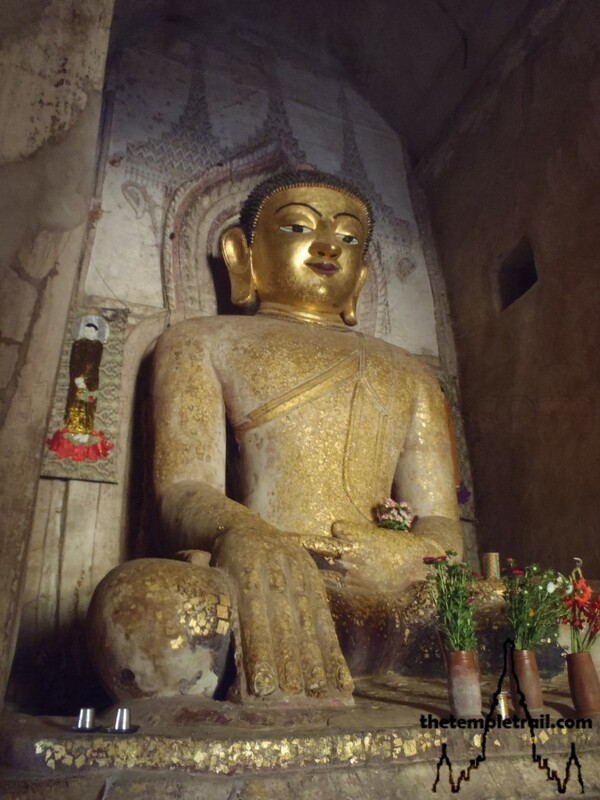 Entering the vaulted corridors of the guphaya, you pass a large Bagan-style seated Buddha. His hand touches the ground to bear witness to his enlightenment. Walking through the darkened interior, your body cools, as does your mind. The inspirational powers that reside deep within the bricks of the temple emit powerfully from the walls. Circling the passages, you eventually feel ready to face the blistering heat of the dry ancient city. 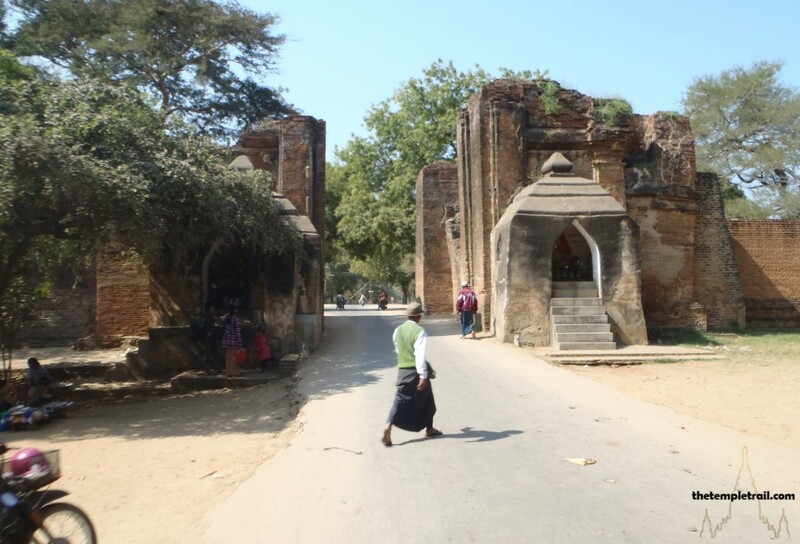 Your travels next bring you to the main road of Old Bagan and the famed Shwegugyi Guphaya, or ‘Great Golden Cave’. You are actually taking a step backward in time to the rule of King Alaungsithu, 12th century successor to Kyanzittha. The amazing story attested to by the Pali inscription on the building is that the beautiful, airy structure took only seven months and seven days to complete in the Sakarit year 503 (1131 AD). Alaungsithu loved the temple so much that he moved here in order to pass away within the corridors of his masterpiece. The large single storey structure glimmers in the sun and its spires pierce the sky. You take in the graceful, decorative structure and you can see the place it has in the evolution of Bagan temple architecture. It marks the change to more vertical structures and elaborate styling. The slender Sikhara helps to enhance the vertical nature of the building. Entering the building, you notice instantly the huge amount of light that floods the corridors, thanks to the many windows and wide passageways. The Buddha aspirant Alaungsithu, clearly had a vision for the temple and as you ambulate, serenely lit faces of Buddha statues gaze down upon you. Alaungsithu wanted to become a Buddha and his efforts went into this temple; he built it next to the royal palace of his grandfather Kyanzittha. The fine floral stucco work and intricately carved woodwork of the doors pops out and demands your attention. 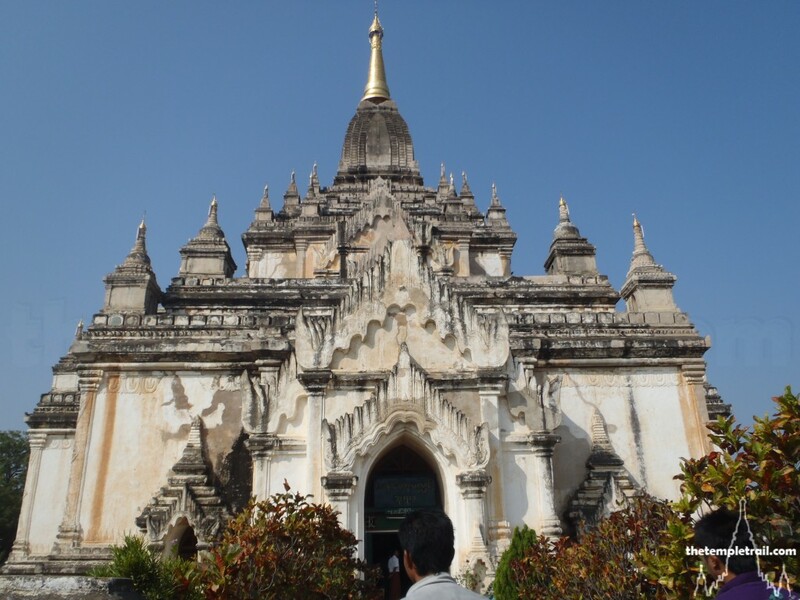 The temple continued to be important and was renovated in the mid-16th century by King Bayinnaung the Great during a pilgrimage he made in the first year of his reign. 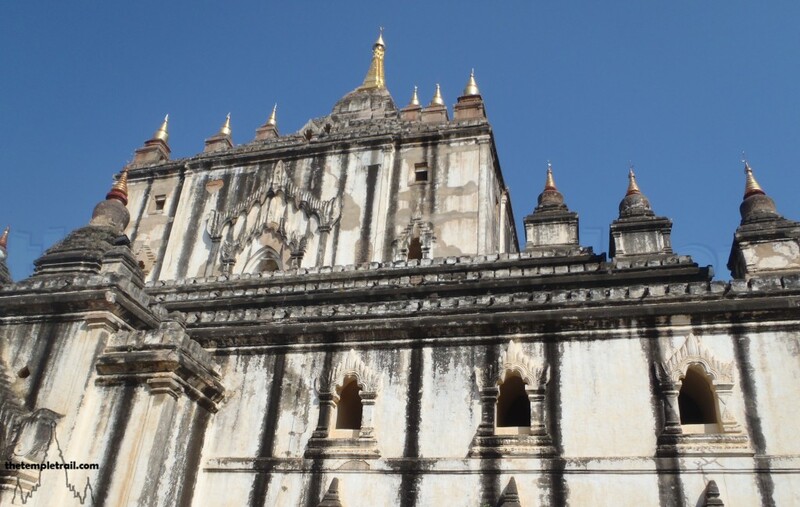 In his restoration of Burmese power, he saw fit to prioritize the rebuild of this great temple, a tell-tale sign of its significance to the Burmese identity. A further short cart journey takes you to yet another of Alaungsithu’s constructions. Thatbyinnyu Guphaya is a lesson in height and is the tallest building on the Bagan Plain. At 61 metres, it is the dominant spire of the votive landscape and the precursor to other post-Mon period temples like Gawdawpalin. 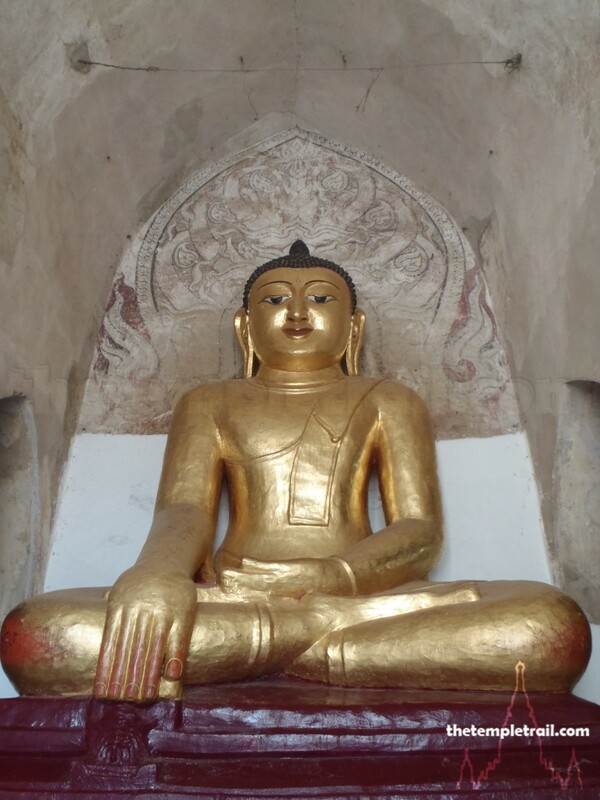 Built in a time when Theravada Buddhism was establishing itself as the dominant sect, Thatbyinnyu means omniscience, referring to the powers gained by the Buddha due to his enlightenment. Before you enter the building, you circumnavigate it and take in the great northern gate of the walled enclosure. It is the only one that remains, but it looks sturdy, yet tumbledown. A smaller pagoda lies to the east of the gate. It is a telling indicator as to the number of bricks used in the main guphaya. It is named the Gayocho (Tally Pagoda) and the story goes that for every 10,000 bricks (one kiln’s worth) used in the main building, one was set aside in a pile to keep tally. Upon the completion of the main building, the tally bricks were used for the Tally Pagoda. Having circled the central platform of Thatbyinnyu, you opt to enter the asymmetrical cruciform guphaya. The building was never totally finished and the set of Jataka tiles about the life of the Buddha were never added, thereby leaving empty sockets for over 500 plaques. Walking the bright corridors of the first of the two main levels of four in total, you tread where monks once lived. Large golden Buddhas watch your every move. The two tiers of windows light up the inscriptions on the walls and make the gold imagery shimmer. The cardinal directions of south, west and north are marked by gargantuan Buddhas looking out of the doorways. Murals decorate the ceiling and you pass a depiction of Sakka (king of the nats) and Brahma (a powerful deva) paying homage to the Buddha. You come to the east and the entrance of the inner stairway that is not hidden as in other temples. It is flanked by nats (guardian spirits). The gates to it remain tightly shut, so not only the nats bar your further progress. It leads to the second enclosed level and the most important shrine of Thatbyinnyu. On the upper terrace is a large brick and plaster Buddha seated on a lotus. The picture of the statue hangs above the gate to the staircase. The heavy damage of the 1975 earthquake included damage to the statue. 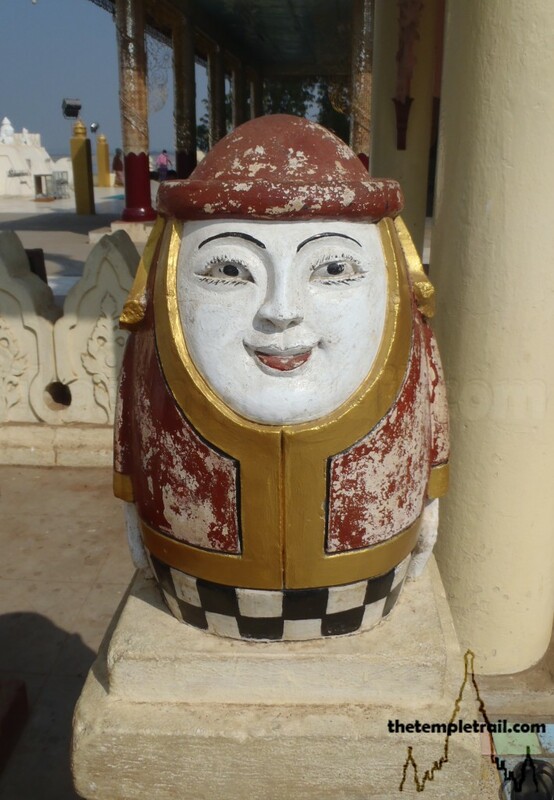 The head broke open to reveal a small Buddha contained within it. The destruction was repaired swiftly, but the authorities in Burma want to protect what remains, so the level remains out of bounds. The view that is so fabled from the highest terrace of Thatbyinnyu must remain in your imagination. 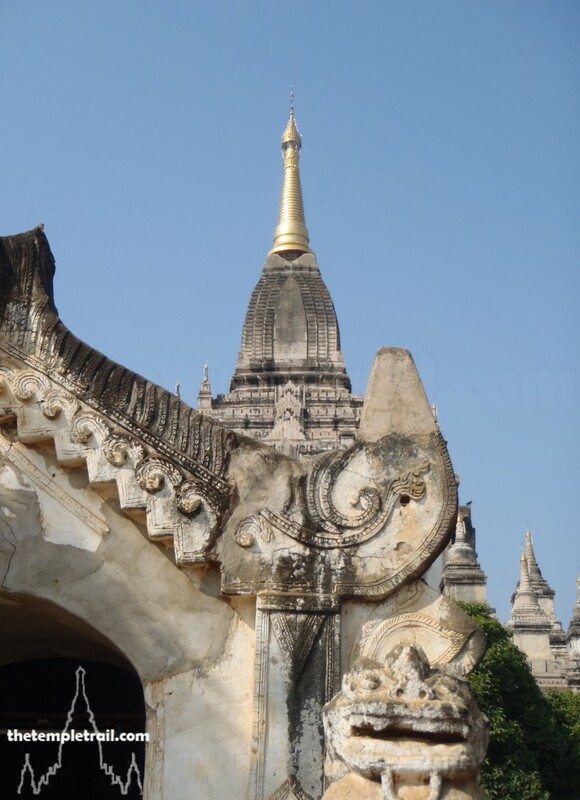 Returning to your horse and driver, you look up at the guphaya and understand the traditional rhyme sung by the locals about three great temples of Bagan: Massiveness that is Dhammayangyi, Loftiness that is Thatbyinnyu, Grace that is Ananda. Leaving the old city, you pass through the only city gate that exists of the twelve that once allowed passage in and out. It remains because of the shrines that sit either side of it. The Tharabha Gate is the main gate through walls first built by King Pyinbya in the 9th century and refortified in the 11th century. The shrines house a pair of nats who protect the city. One side houses Min Mahagiri (Lord of the Great Mountain) and the other side, his sister Hnamadawgyi (Royal Sister) or Shwe Myet-hna (Golden Face). Min Mahagiri was known as Maung Tint De in his lifetime. He was a blacksmith that the king of Tagaung feared for his strength. He ran away to the forest to escape the king’s soldiers. The king then married the sister of Maung Tint De, Myat Hla, and had her call him to take up a position in the kingdom. When he returned, the king tied him to a tree and burned him alive. His sister then jumped into the flames with him. The spirits lived in the tree and caused trouble. The tree was uprooted and sent down the river to Bagan, where it was carved into images of the nats and enshrined on Mount Popa (the abode of the nats). 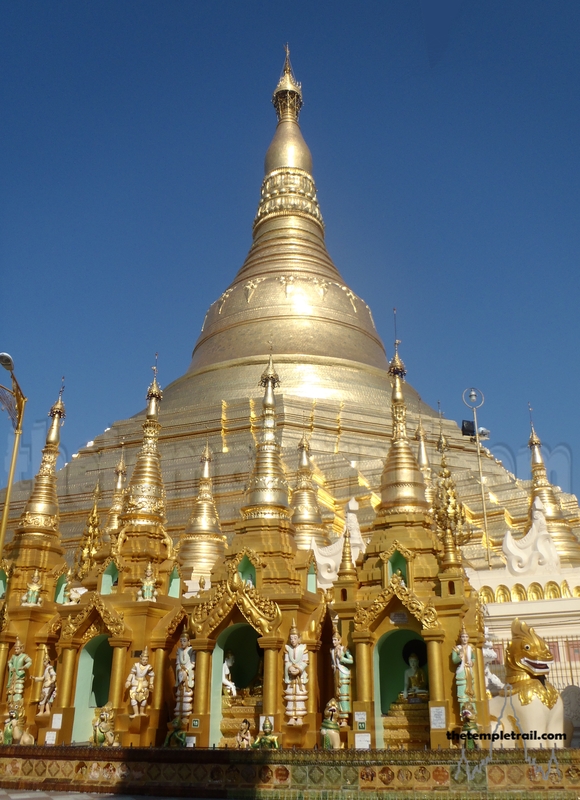 The two are worshipped by the local Burmese to this day and the shrines remain popular places of devotion. Any new vehicles in the area are presented to the nats at Tharabha Gate in order to gain their blessing. Stopping the cart, your driver urges you to go and present yourself to the Great Mountain nats. You do so and as you come back down from raised, but simple shrines, you feel like you have been accepted by the spirits that govern the holy landscape. You feel as though you have become part of the rich history of the old city and the surrounding plains. Getting back on your cart, your driver gees on the tired horse and you lazily return to your hotel under the benevolent protection of the nats. 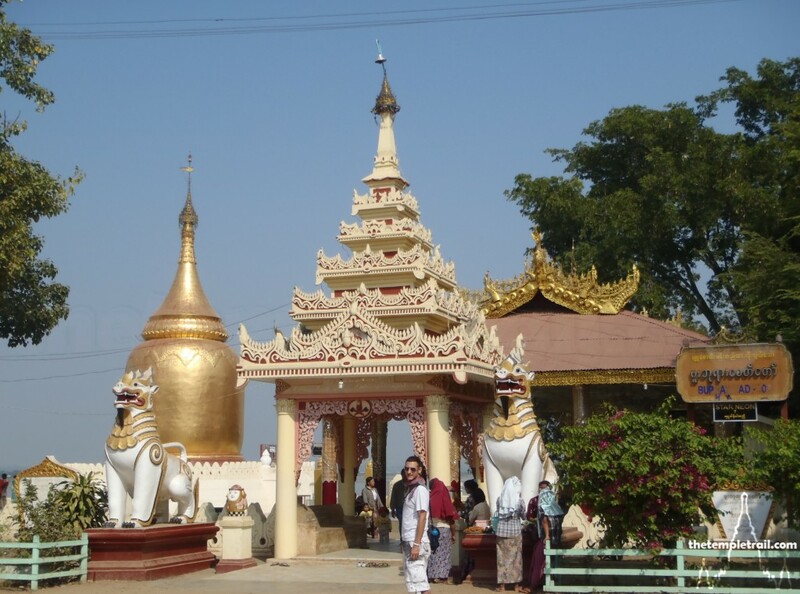 I had a great time in Bagan back in 2012. I recently posted a recollection of my thoughts on mightytravels dot com ‘Why you should go to Bagan, Burma before it’s too late’ . It’s such a beautiful and tranquil place. I hope it stays that way for a little longer! I hope it does too, but the inevitability of mass tourism looms over Bagan. It depends on perspective: to me I would love it to remain the same, but to the local population, an influx of tourist dollars would be welcomed with open arms. I only hope that a balance can be found between allowing the local people a better future and retaining the atmosphere and integrity of such a wonderful place. Hi there, just became aware of your blog through Google, and found that it’s really informative. I’ll appreciate if you continue this in future. Lots of people will be benefited from your writing. Cheers!